daveha11 January 1, 2019 August 6, 2018 They promised us ... the Guardian, 2018. Star Trek has a lot to answer for. Not content to tease us with unreasonable expectations of phasers, it has also thrust into popular imagination the idea of teleportation, in which we step into a giant scanner of some sort and instantaneously find ourselves somewhere else, mind, body and soul intact (and hopefully untainted). Theoretically there are really only two ways this can(’t) be done – physical deconstruction at x and reconstitution at y, or the translation of one’s person into data to be transmitted, then reconverted into matter, like some organic fax machine. Impossible? 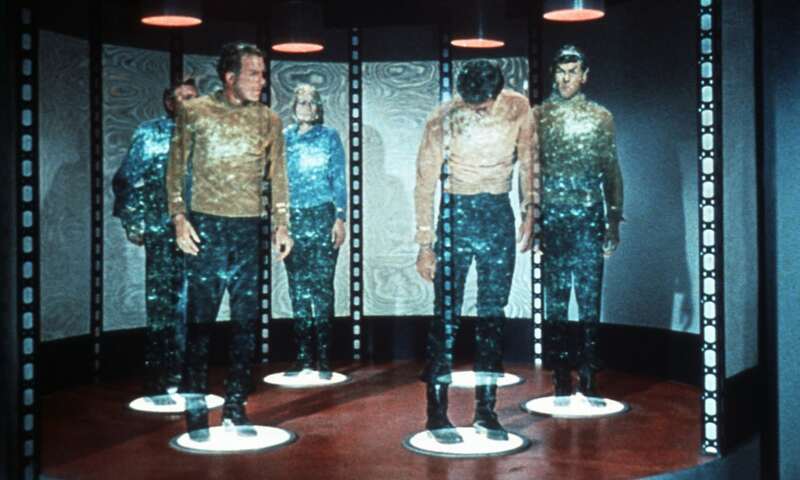 In 1993 an international group of six scientists, showed that perfect teleportation is possible in principle, or at least not against the laws of physics. And it so happens that recently, scientists both in the US and China have been trying. Just last year, Chinese scientists were able to “teleport” photons into a satellite 300 miles away, using a spooky phenomenon called “quantum entanglement”, in which (simply put) a pair of photons are able simultaneously to share the same state, even separated by vast distances. Change the state of one particle, and weirdly, the other changes too, with no detectable connection. Scientists are just beginning to suss how to use this “spooky action at a distance” (as one A. Einstein dubbed it) to transfer information between the two entangled particles: by shoving in a third particle to entangle with one of the original particles, the distant particle mimics exactly the state of the third particle. We are still working out how to teleport photons. Assuming somehow we discovered how to teleport atoms, then molecules – perhaps in the next decade, as upbeat pop physicist Michiu Kaku has suggested – the amount of bits to record and transmit is unthinkable. Even an e-coli bacterium contains 9×10 to the power 10 atoms; you have about 32 trillion – or about 800 billion more cells than there are stars in the known universe. Imagine the size of the scanner. According to a highly entertaining University of Leicester study in 2013 into the computing power required to teleport a human being, your cells, broken down into data, equates around 2.6 x 1042 bits, which is 2.6 followed by 42 zeroes. You would require stupendous bandwidth – and the quicker the transmission, the more power needed – roughly 10,000,000,000,000 gigawatt hours, which means teleporting one human being would be like hogging the entire UK power supply for over a million years. Transfer time: some 4,8 million million years – or about 350,000 times longer than the universe has existed. It would literally be quicker to walk. And after such a long wait, you might not even survive the transfer. Even our top 3D printers, materials and scanners are unable to faithfully reproduce a cowpat, much less a human with its neurons, memories, thoughts or personality. Even then, would you not be transmitting a copy? What happens to the you at point X when you at point Y appears? Will original you be zapped? If so, in their right mind would test this wondrous machine? Yet Michiu Kaku, as a renowned physicist, thinks these problems are solvable – and that human teleportation may be possible within 100 years or so. He envisages a teleporter that works like an ultra high-res MRI scanner, with accuracy at the single-atom-per-pixel level. To transmit this data, Kaku proposes using x-rays, which have super-quick wavelengths that carry 1m times more data than normal optical fibre. Your data would than be beamed, encrypted, into space, bounced around a satellite network and beamed to a quantum computer the other side of the world to unpack. Kaku neglects to say what we would do with the original you, leaving the problem to others, but goes so far as to predict the transport of a simple molecule in the next 10 years, soon to be followed by DNA. So much for data and atom smashing. Why not forget disintegration and reasssembly, and simply concentrate on transporting material over large distances quickly, as with any transport? Would warping spacetime count as a method of teleportation? We have all heard of the folded paper analogy, which seeks to bring two distant points together by simply “folding” spacetime dot-to-dot to create an Einstein Rosen Bridge. Bad news is this well-worn device remains firmly theoretical, and being associated with black holes, has the disadvantage of stretching your body out into a line the width of a single atom before you get anywhere. That leaves other methods, llike plasma beams, which theoreticaly could blast you from London to Sydney in about a minute, or simply using “conventional” vehicular travel, using something like Nasa’s highly promising EmDrive, which might be able to transport humans using a so-called ‘warp-bubble” to places near and far at faster than the speed of light. But maybe teleportation is a step too far – perhaps once again we are a victim of our own imaginations: just because you can think it, doesn’t mean you can do it. Besides, I think I’ll stick to vehicles. I do like to arrive in one piece. Previous Maglev trains: why aren’t we gliding home on hovering carriages?